1. Sieve Gram/Besan flour in a bowl. 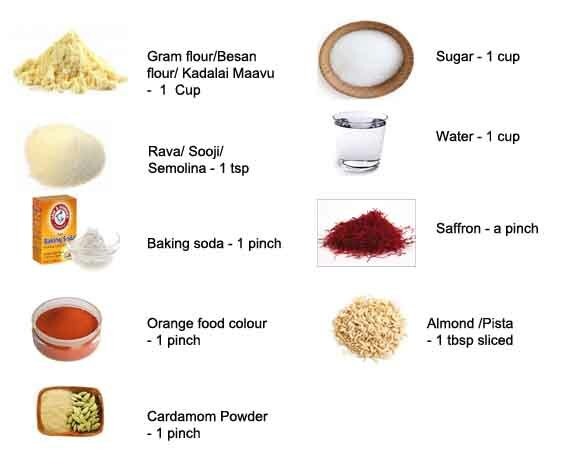 Add sooji/ semolina to the gram flour add water and food colour to make a batter like dosa batter(not too watery). Mix without lumps and keep it aside. For sugar syrup: Boil the water and sugar together until one string consistency in between stir. 2. In between making of sugar syrup, Heat oil in a kadai add oil and bring into boil. Take a perforated ladle for making boondis (ladle having holes) one for making boondis and one to take from the oil. Pour the batter on the ladle , keep the ladle on the top of the oil. Tap little to get down all the boondies on kadai and fry them in oil. Not too crispy, just boondi is cooked and it should be little soft only. Take this fried boondies out and put them in a tissue paper. Make the boondies by repeating this process until the batter is finished. 3. Take these fried boondi in a bowl. When the sugar syrup is in One string consistency then add the sugar syrup(it should be warm if not just make it warm) and mix well and make it to absorb. Give a pulse this mixture and put this mixture into the bowl. 4. Add sliced pistas and almonds to this mixture. 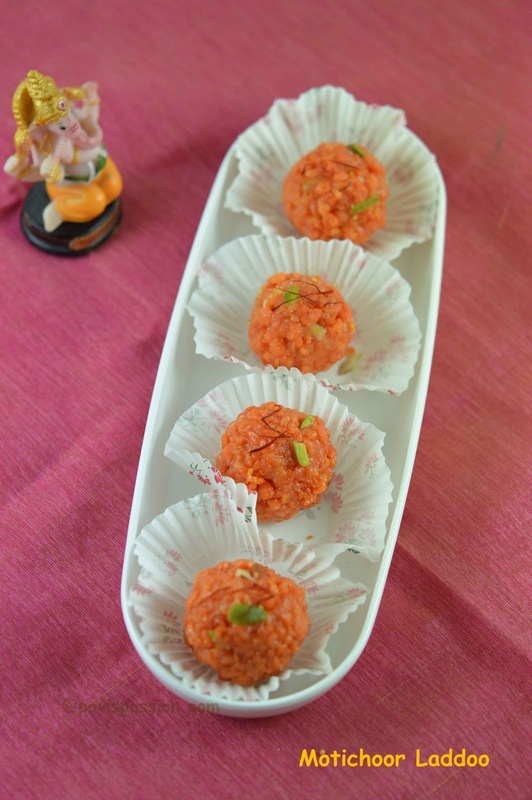 when it is warm just make ladoo by holding the mixture in the palms and start making ladoos. Serve and enjoy with you family! 1.The sugar syrup must be in 1 string consistency. 2.The sugar and water proportion is 1:1. so it comes quickly to one string consistency. if it comes just switched off and keep it aside. 3.While making boondies, fry this boondies as just cooked not crispy. if it is crispy it cannot be used for making ladoos it can be used as a snack. If boondi have tails no problem for Motichoor ladooo because we can pulse this mixture at last. 4. After making boondi process, you can add sugar syrup if it is not warm just warm before adding it to boondi. otherwise not absorb.After adding just wait to absorb. when it is warm give a pulse fast and make ladoos without drying it. While making ladoo the mixture should be warm. 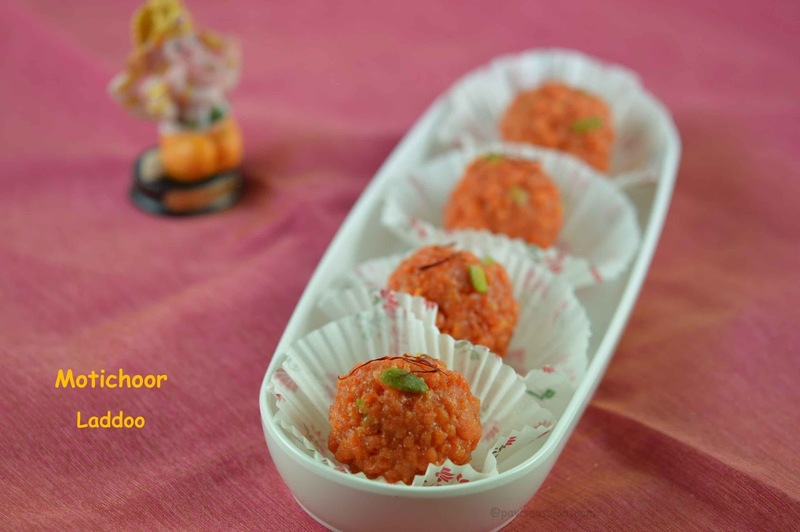 If not you cannot make it as ladoos just boondi only. 5. So whole process should be done continuously done without waiting. 6. 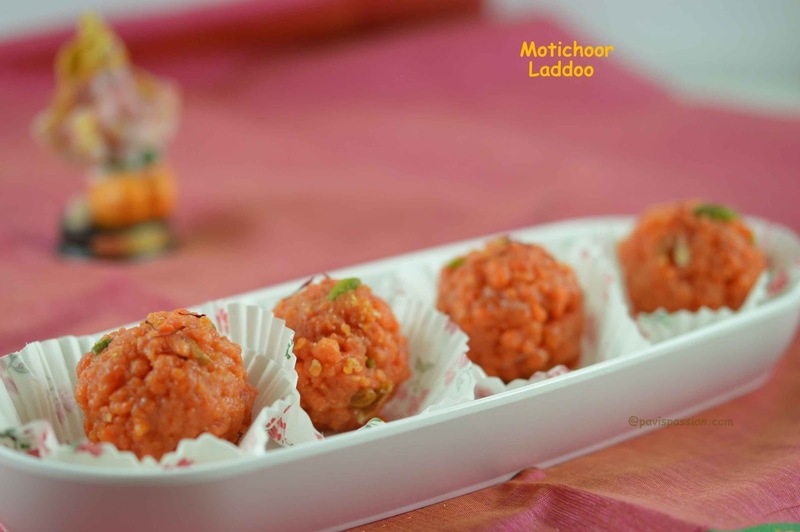 The ladoo is little moist while making after few hours it will be ok.